The upper and lower trailing arms work together to positively locate and control the rear axle. Launches are quicker, smoother and more consistent by eliminating wheel hop. Cornering and overall stability are dramatically improved through increased roll stiffness and sway bar effectiveness. 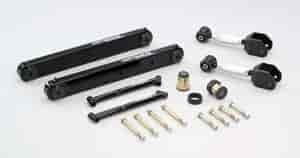 The fabricated Trailing Arms are constructed from high quality, heli-arc welded, .120'' wall steel tubing. They feature an exclusive billet CNC machined spring perch and are fitted with special fluted polyurethane bushings. By eliminating unwanted suspension deflection, these components can easily handle the demands of high horsepower, big tires and even racing slicks. . Does Hotchkis 1804A fit your vehicle?